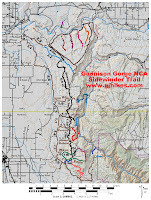 The Sidewinder trail is located in the Gunnison Gorge National Conservation Area near Delta, Colorado. The north end of the trail begins off of the South River Road where it stretches for laterally 20 miles across the mid section of the mountain until it comes to an end at the Eagle Road. There are numerous technical features along the trail where it encounters rocks and rough terrain that require advanced mountain biking skills and caution for dirt bikers. 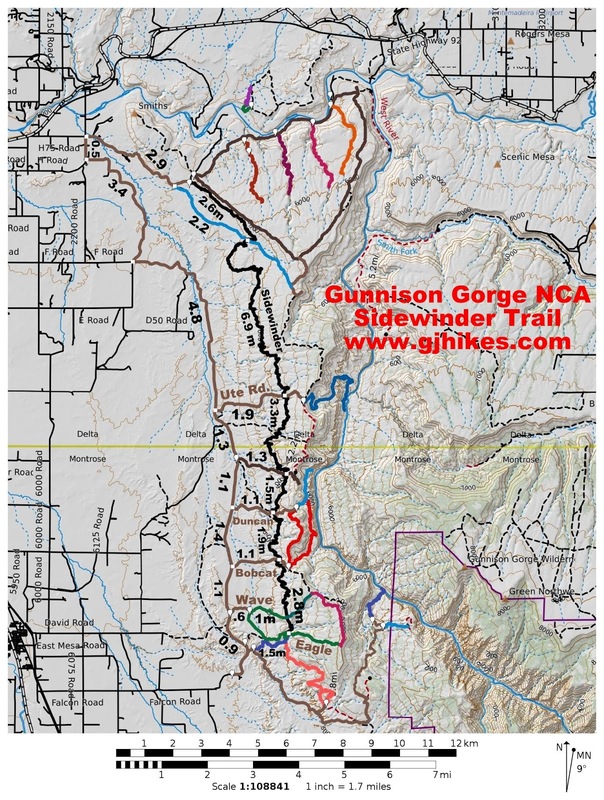 To get to the trailhead in the northern area of the Gunnison Gorge NCA drive east out of Delta for 7 miles on Highway 92 to Austin and turn right onto 2200 Road. Follow 2200 Road for about 1 mile and turn left onto H75 Road. It is about 3 miles to the Smith Mountain/Sidewinder trailhead. The Sidewinder trail departs from the trailhead through the trail squeeze that is just left of the information kiosk and restroom. Trail markers in the Gunnison Gorge NCA sometimes have a short life expectancy so it is always good to have a map and a general idea of where you are going. The trail starts out by climbing around the hillside as it leaves the trailhead. For its entire length the trail follows the contours of the mountain wrapping around each ridge and then retreating to the head of each crease where often times there is some type of wash to dip in and out of. Near the 2 mile point there is a rocky feature that isn't suitable for horses so they made an alternate route for them to get around it. At the 2.5 mile point the Sidewinder trail crosses the Powerline Road. This is the first opportunity to cut the trip short and loop back to the trailhead. It is about 2.6 miles back to the trailhead but it is all easy riding. It is almost 7 miles from the Powerline Road to the Ute Road. Even with some of its advanced features this section of the trail goes by pretty fast. Around the 9.5 mile point the Sidewinder trail crosses the Ute Road. To cut the trail short at this point it is about 1.9 miles of awesome downhill to get to the Peach Valley Road. By the time you get back to the trailhead you will have completed a ~23.5 mile loop. The next crossroad comes up around the 13 mile point where it is about 1.2 miles down to the Peach Valley Road. After another mile and a half of the Sidewinder trail the Duncan Road is the next major crossroad. From here it is 1.1 miles down to the Peach Valley Road. There are a couple of places where the Sidewinder trail takes advantage of a dry wash to follow. They generally add a nice variety to the trail. Next comes the Bobcat Road where it is also about 1.1 miles down to the Peach Valley Road. And that is followed by the Wave Road. From here is is about 1.7 miles down to the Peach Valley Road. The Sidewinder trail comes to the Eagle Road just over the 18 mile point. To get the ride to come out to the 20 miles that it is advertised to be you need to follow the Eagle Road for another 1.5 miles or so to the Peach Valley Road. From there it is another 17 miles back to the trailhead. It starts out with a little hill to climb and after that it trends downhill for 5-6 miles. As the Eagle Road makes its climb out of the wash it gets up to a saddle in the ridge where there is a connector that runs over to the Wave Road where it is only about 7 tenths of a mile out to the Peach Valley Road. It is a nice optional route that cuts out the hills on the Peach Valley Road between the Eagle and Wave trailheads. The only other real option is to make use of a shuttle vehicle. The Sidewinder trail is a heck of a workout no matter how you decide to go about it. If you would like to see it for yourself then all you have to do is grab your bike or 'Take a hike'.